Diff'rent Strokers :: View topic - Not another AR story? Posted: Wed Nov 02, 2016 8:44 pm Post subject: Not another AR story? well another of these pesky critters has managed to find her way into my garage but not with the mighty power of a 125cc, oh no, this time it's a real tiddler, in the form of an AR50! Massive thanks to Phil at Holmetech, just up the road from here. It's a day off work tomorrow so it'll be time to take some photo's etc. 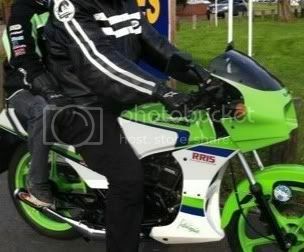 I thought the AR125 was light but this wee beastie should be weighed in ounces, rather than kg! The decals are a perfect example of what happens when the Japanese designers partake in too much Saki. I just hope tomorrow gives some quality daylight to show what I mean. This time, this Tiny Tiddler has new tyre's and even an MOT, so I'll be able to see how slowly she runs, before doing small, rebuilding of sections of the bike. First thing to be stripped however will be the carb, to give it an ultrasonic clean, to remove any longstanding fuel varnish etc. Is it the black one he was selling? Can't wait to see it...oh and hear about life at 35mph..
no the black one had already gone, so I've got he red one. After a proper chat with Phil from Holmetech, it appears that the red one was by far the best condition of the two bikes he was selling. Also she's only covered 9,000 mies, which was less than half that the black one had done. Photo's will follow this morning. I can certainly help with extras such as the rare rear hugger and belly pans when you decide what your doing with it. basic strip down started, just to check all is well before I did anything else. 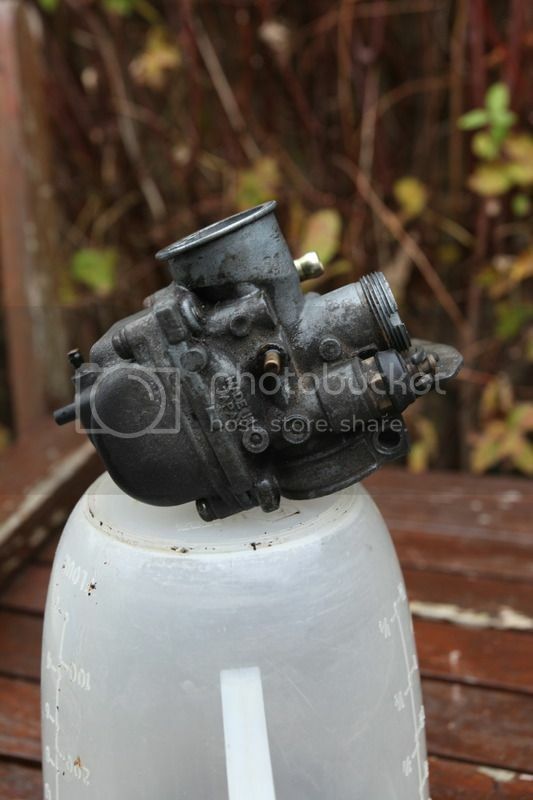 The carb wasn't too bad but I removed it to give it a thorough cleaning and, whilst making access I found the air box had been modified twice! Once by drilling some bloody great holes in the side and second by finding the lower mounting bolt had been mullered, so someone had just sawn off the bottom of the air box! So I'll need to see if I can source an original. 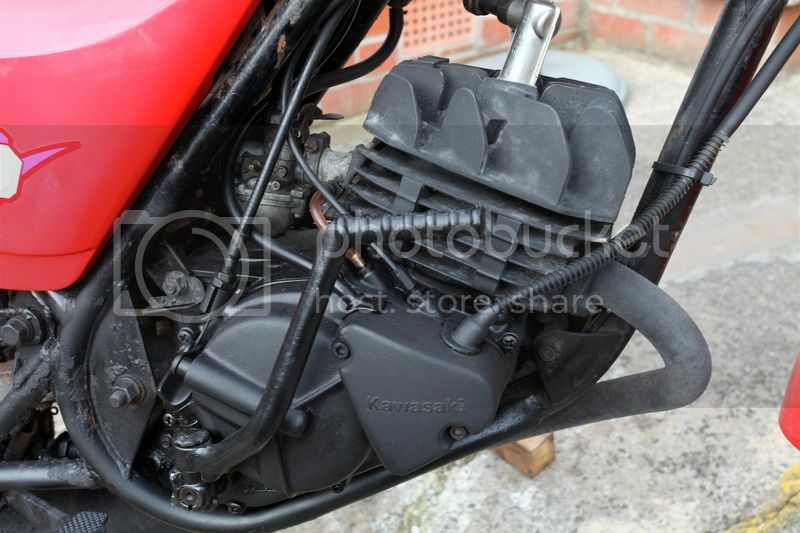 Anyway, carb drained, stripped and cleaned up, new fuel and on the third kick, she burst into life! I then removed all the plastic panels, to keep 'em safe - until I decide what my plans are. Do you have any shots of the rear hugger and the belly pan? I may fancy this one may become white n green! Photo's will follow later, once Photobcket decides to play the game. With a mere 9153 miles under her belt. 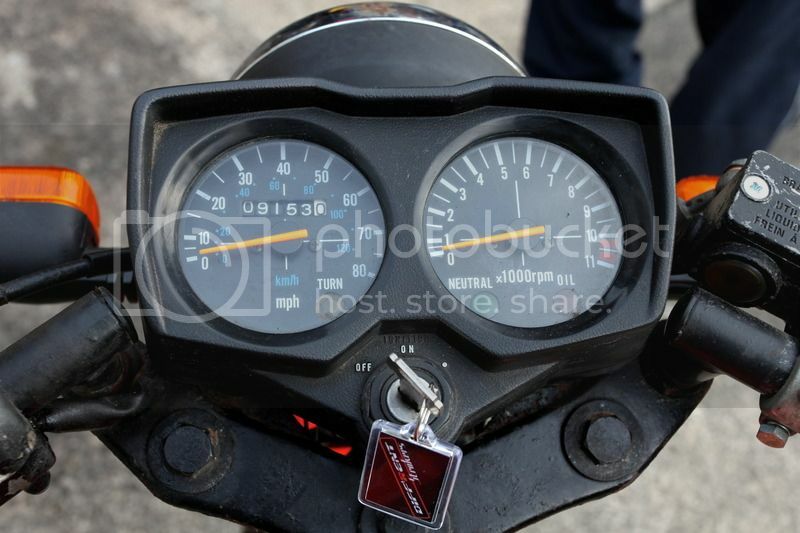 The engine looks pretty standard and free from signs of ears or abuse. Here's the grubby looking carb. And once cleaned, I did my usual in changing the float bowl screws with Allen headed stainless bolts. 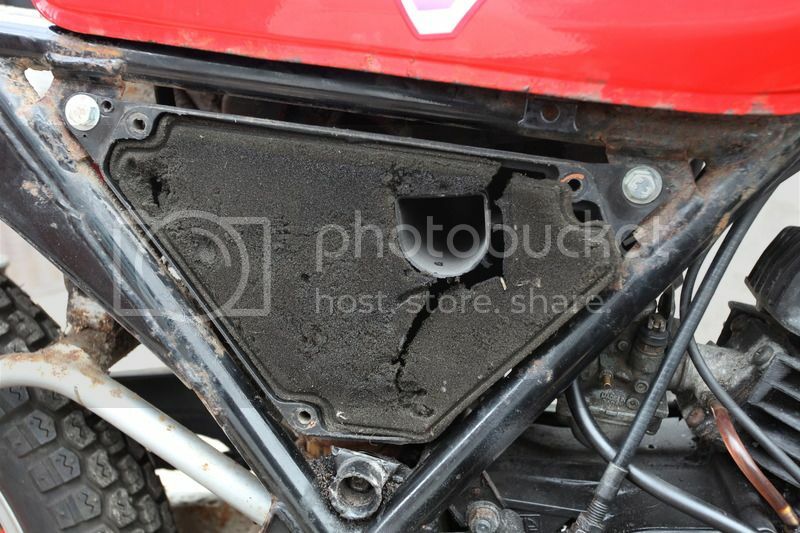 As you can see, the air filter has seen better days, as has the air box, as you can see on this shot where it was cut from the lower mount.! More images to follow once I get a chance to take 'em. So what colours do our friends out there reckon I should do? By the way, the DS keyring I picked up at Stafford has been out into use! You didn't have to buy a new bike just to find a home for the keyring Reggie ! I couldn't think of a better excuse to do something special with such a fine keyring! I agree with TS^, would be nice to keep it original. How about if I powder coated the swinging arm and frame, in the original colours then? Looks pretty good CM, not too much bodgery (if that's a word?) by the look of things. 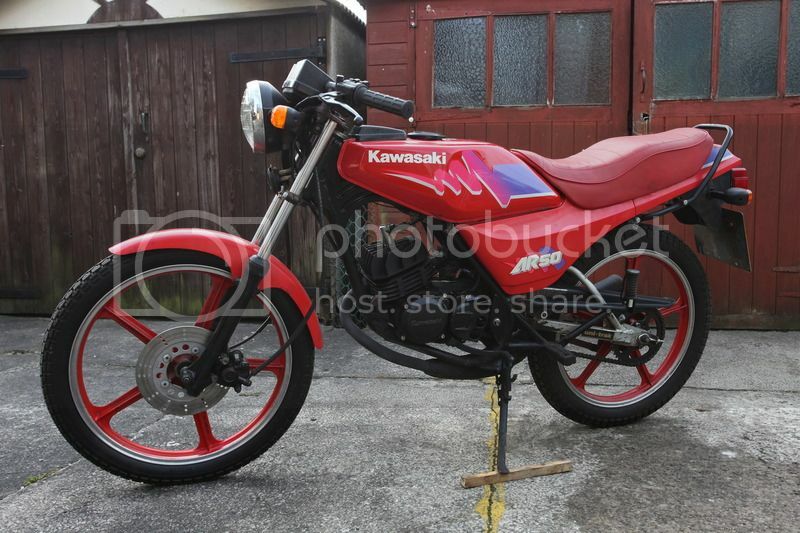 I would change the colour scheme though, keep it red but go for an early A1R race bike paint scheme. I don't suppose you know of a decal supplier that offers exact copies, so I could have the panels fully repainted, decals applied, then coated? I ask as the tank needs a few small repairs so if I was to keep her standard then I'd really like her to look as standard as possible.